Hey guys! When my friend invited me over for a Sunday afternoon party complete with gorgeous NYC views and giant Jenga on their patio, I was in! Since I knew many of the guests were health conscious like me, I thought I’d prepare a healthy appetizer. Because it was a hot summer day, my watermelon and arugula salad popped into my mind as being a refreshing option. But, many parties don’t have plates and silverware. Finger foods can often be the best solution. So, I thought…let’s get creative. 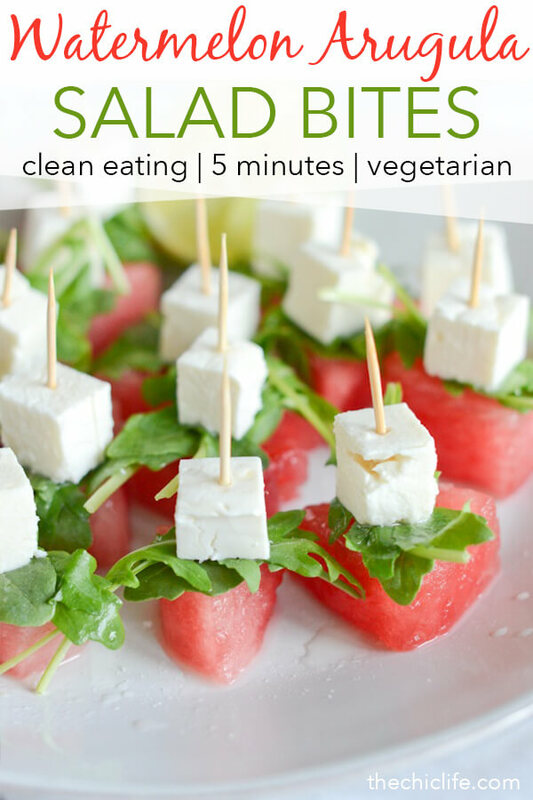 Let’s make the salad but in bite-sized form! 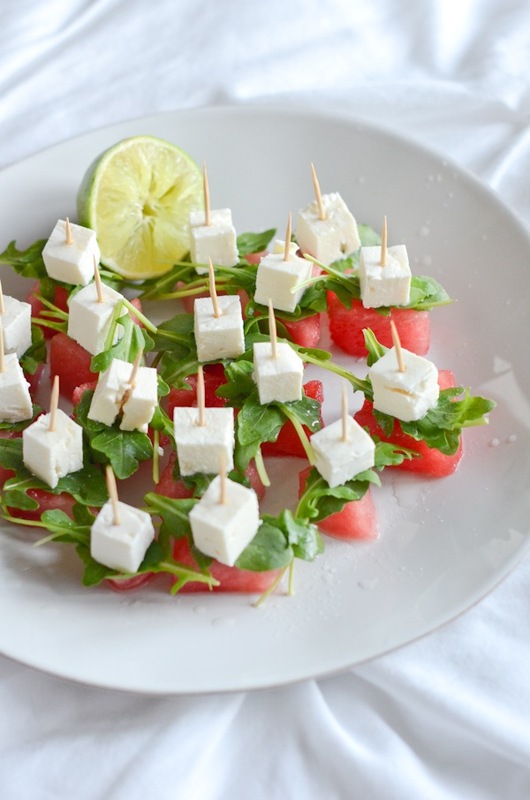 So, I re-constructed that salad recipe as Watermelon Arugula Salad Bites. They were just as good as the salad form but so much better for sharing at a party. I knew it was a winner when my host brought my plate of watermelon arugula salad bites out onto the patio, and I heard a stream of “Oohs!”. Yas! This recipe would be great for any party, potluck, grill-out, and/or BBQ event. Especially if it’s on a warm day. 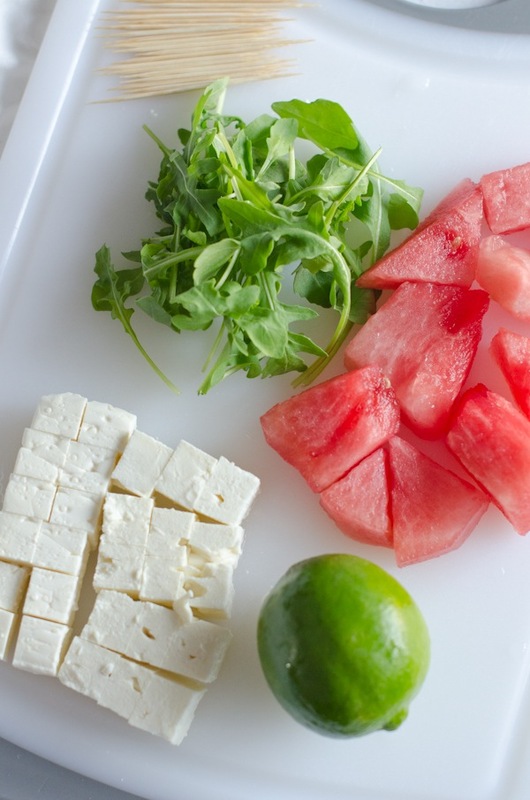 This watermelon arugula salad bites recipe is seriously refreshing when the heat is on. And that’s it! So simple! Just four key ingredients, plus salt and pepper. I feel like I can barely call this a recipe. The amounts are super forgiving. I’ll try to estimate measurements for the recipe, but I really just made enough to fill a dinner plate and had plenty of ingredients left to make more salads in either bite or traditional salad form. 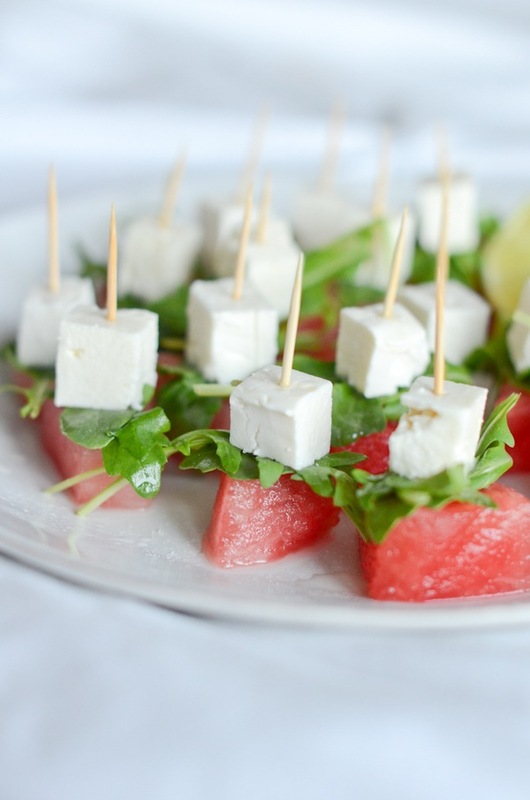 I left the lime halves I used for this watermelon arugula salad bites recipe on the plate for garnish. They help you instantly identify the flavors. And while there are just under 20 bites on the plate pictured, I actually ended up cramming about 10 or so more onto the plate. I thought it looked a little nicer spaced out for the photo. But it still looked pretty good with more on the plate. 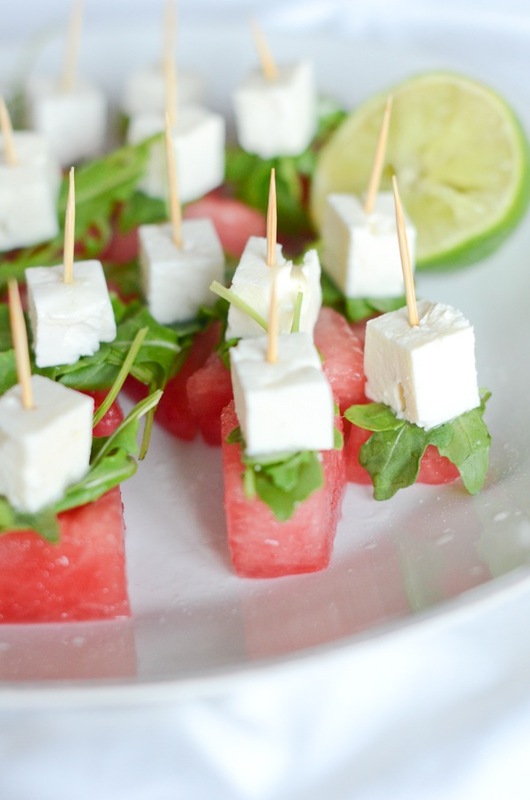 Be the star of your next party by making these healthy, delicious, and refreshing Watermelon Arugula Salad Bites. They’re easy, impressive, and so good! The measurements here are approximate. You can easily increase or decrease the amounts of any part, depending on the size of your party. One lime is enough for about one dinner plate worth of bites. 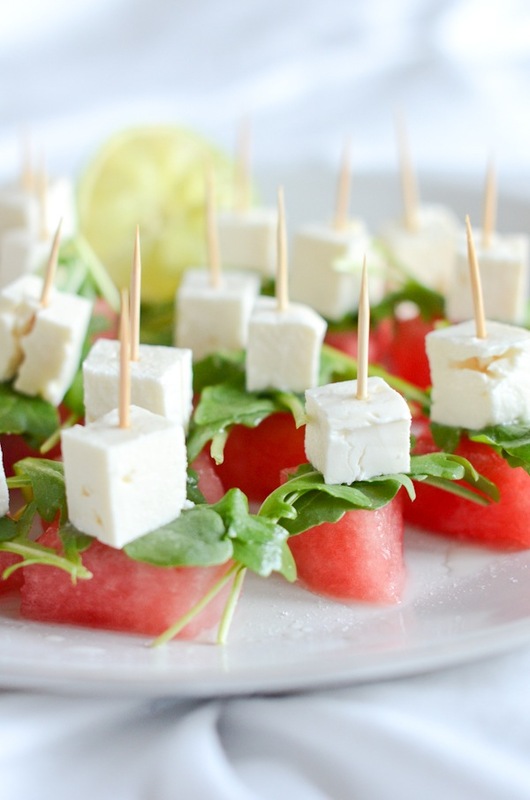 Place one cube of feta onto a toothpick, add 3 arugula leaves and place toothpick into a piece of watermelon. Repeat until you have one dinner plate full of bites. Sprinkle bites with salt and fresh-cracked black pepper. Squeeze fresh lime juice over the bites. Serve, enjoy, and impress your friends! I made approximately 30 bites to fill one dinner plate. But make as many as you need! And did you see my research on whether yellow watermelon is natural? Click here to check it out! 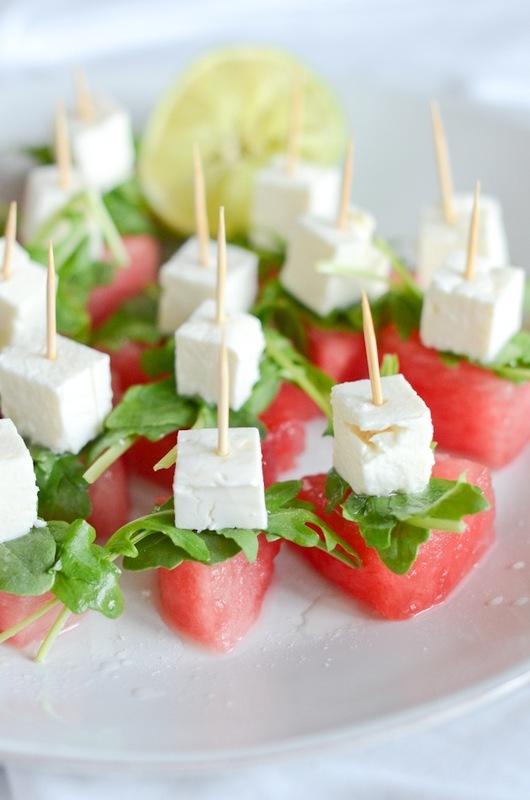 Hope you like this Watermelon Arugula Salad Bites Recipe! Thanks for reading!